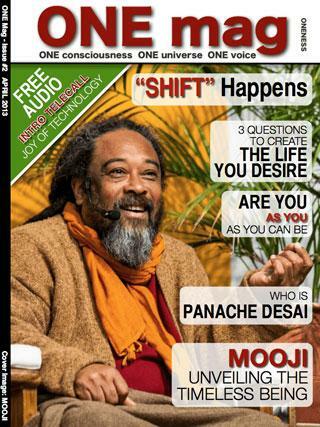 The French written article as a downloadable pdf can be found here: La Joyeuse Liberté de Mooji. You can watch the recording of the Skype interview here: Living in the Joy of Our Natural Being. An engaging Skype interview featured in the first edition of LIFT YOUR MIND. Mooji speaks with Lisbett about how to transcend the stress and anxiety of daily life into our Completeness. The full article with a written introduction to the Skype interview can be found here: Lift Your Mind magazine. 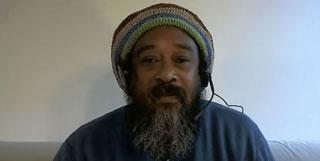 You can watch the recording of the Skype interview here: Interview with Mooji. 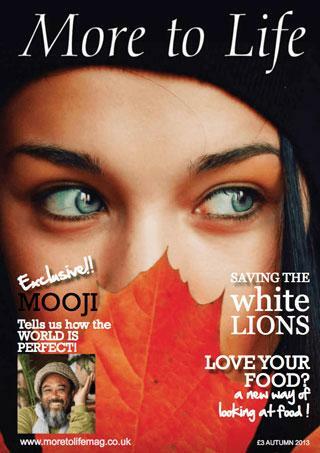 Mooji was asked ‘What is the meaning of life?’ by the online magazine Excellence Reporter. ‘This is perhaps one of the most seemingly profound questions within the human kingdom. Yet at closer scrutiny it is revealed as one of the most elusive in as far as coming to any one satisfactory answer. 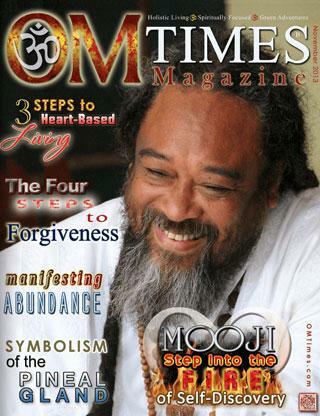 The rest of Mooji’s answer can be found here (pdf version). All genuine seekers of Truth must become aware that we are already that which we are presently seeking, that the Truth is inside us as one undivided Reality. This is the most important search in the human kingdom: the search for our ultimate understanding leading to the end of all suffering. 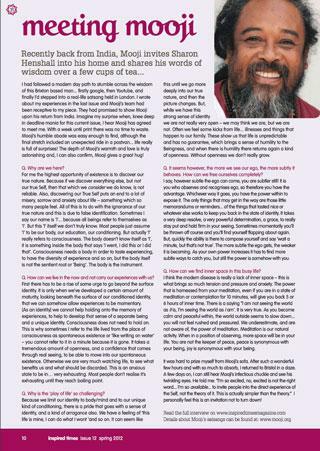 Interview with Mooji. Levekunst—Art of Life sent Erling Jensen to ask Mooji five questions about the nature of enlightenment, experience, restlessness, ignorance and guarantees. This beautiful interview can be found here (pdf version). I know that for many, trying to create peace in order to make the world a better place is a very, very enticing idea — but find inner peace first. And then see what peace wants, not what “you” want. The peace that you are searching for is already inside your heart. We only need to be aware of it. It cannot be created. Peace was never created. It is the perfume of the living God, of Truth. These are excerpts from Mooji’s contribution to the book, Talks on Peace. The book is in German, but we are happy to share the original piece in English as well as the German translation: English version (pdf), German version (pdf). To find out more about Talks on Peace, visit here. “People step onto their path in small steps, but each step must challenge something within ourselves which we consider to be vital. When your mind begins to work in new ways, whereby it’s coming out of its conditioned groove and isn’t so full of resistance, pessimism and doubt anymore, you will start to move inside a new field of presence that is true, spontaneous and spacious”. 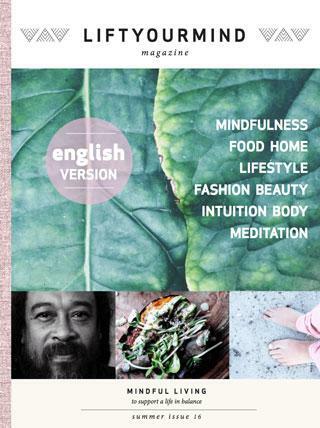 An interview with Mooji by Balance magazine from March 2015. Part 1, Part 2 (pdf). 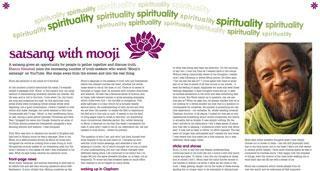 An interview with Mooji by Rohini Singh was published in Life Positive magazine (pdf version). 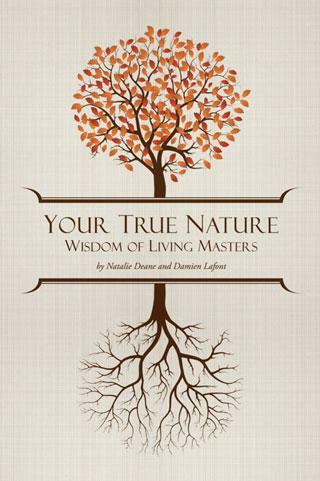 This interview with Mooji by Damian Lafont was published in the book Your True Nature: Wisdom of Living Masters by Natalie Deane and Damien Lafont. An article in Positive Life Magazine. Interviewed by Paul Congdon. Part 1 pdf, Part 2 pdf. Who Are You Without Your Problems? is an excerpt from the book Before I Am (2nd edition). 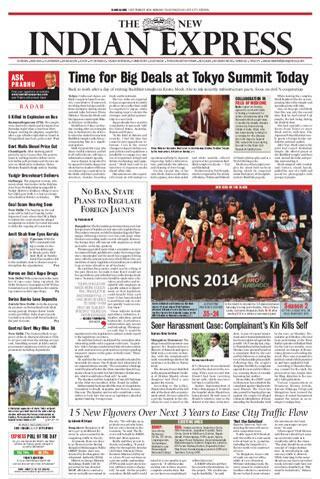 A beautiful article, imbued with wisdom and joy! In the second part you can read an interview filled with important questions and clear, powerful pointings. 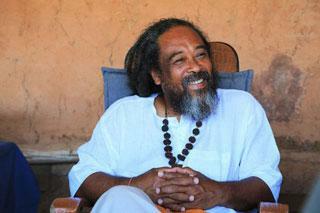 You will also find details about Mooji’s own spiritual journey and discovery of Truth. 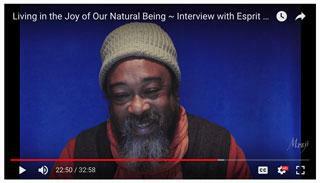 Dirk Terpstra from Super Souls interviewed Mooji last month. 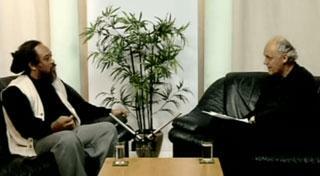 During their informal conversation, several crucial aspects of life are discussed. 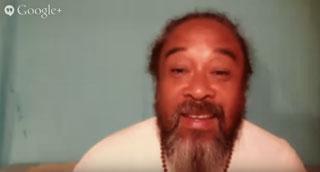 Mooji explains how to find a balance between our spiritual being and our hungry ego, gives us a deep insight in what love is, elaborates on truth and much more. 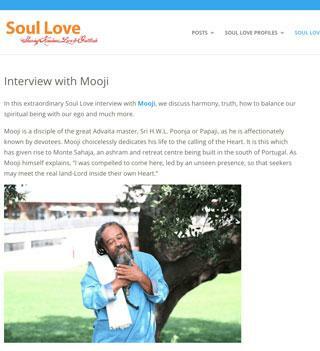 You can read the full article on SoulLove.com, Interview with Mooji, or download the entire article here. Article from ONE MAG Spring 2013. 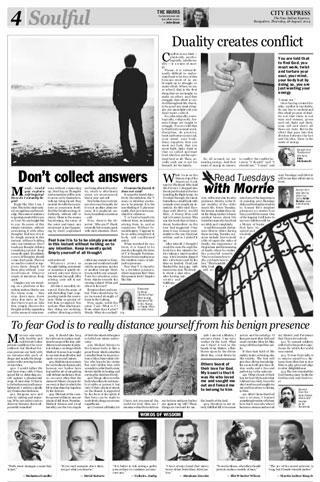 An article describing the author’s first encounter with Mooji and live Satsang in Rishikesh. The impact of this meeting was unexpected but tremendous, leaving behind nothing but gratitude and a beautiful empty space. April 2013 issue. An article published in two parts in the Winter & Spring 2012 issues. Inspired Times magazine. In the first part of the interview Mooji talks about the essence of non duality and how individuality and diversity are not in conflict with the oneness that non dual teachings are pointing towards. 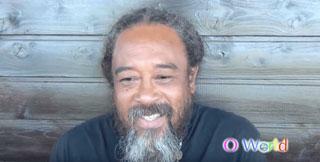 He also talks about coming out of fears and conditioning and about finding our life purpose.In the second part of the interview Mooji explains the meaning and importance of Satsang and meditation for the one who is searching for Truth. And finding this Truth is the purpose of our existence. Only when a being is awake to its non-dual nature it becomes possible to enjoy duality without being attached to it. An article from Kindred Spirit Magazine. 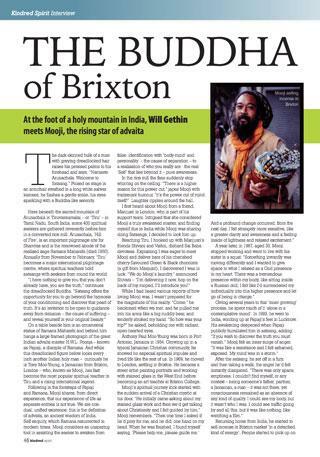 Will Gethin meets Mooji at the foot of Arunachala and is impressed by his radiance, open heartedness and loving presence. 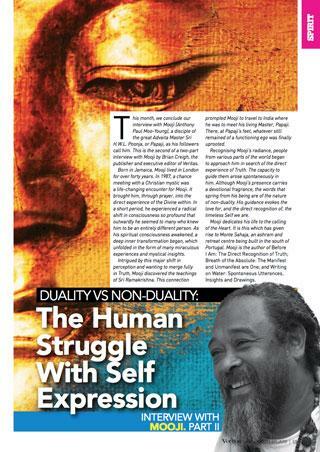 In this article he speaks about Mooji’s journey of self-discovery, about his Satsang experience and other seekers’ testimonies. Read the pdf here. 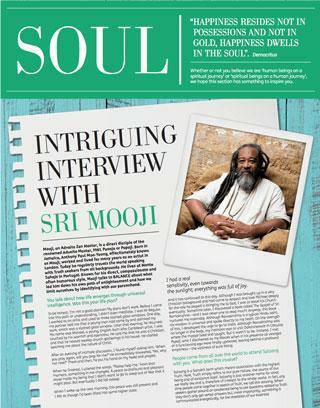 Sharon Henshall met Mooji on YouTube, and was inspired to contact him for an interview for her magazine. Read the pdf here. A beautiful article springing out from the heart of the writer who was deeply touched by her encounter with Mooji and the Sangha. She writes about Mooji’s biography and her Satsang experience. 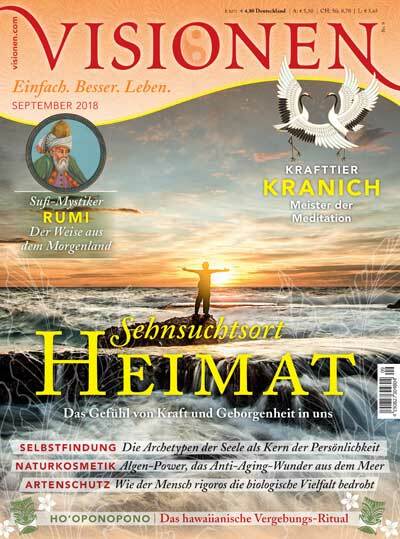 This article is written by Eva Hofmann for the German magazine Visionen is available to read in English and German. 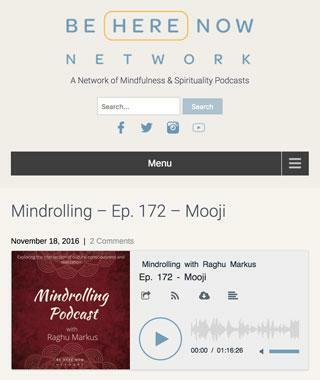 Mooji was interviewed by Raghu Markus, executive director of the Love Serve Remember Foundation via Skype for Mindrolling Podcast. 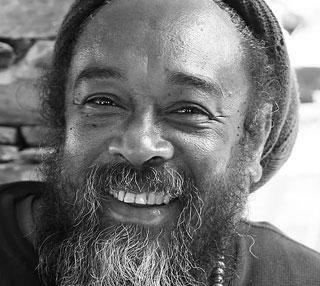 In this beautiful sharing, Mooji, with his renowned directness, warmth and wisdom, speaks of his own journey, self-inquiry, presence and love, and his bright encouragement and pointing to the Truth already established within each being. You can listen to this interview by Phil Cartwright here. An Ice Cream 4 the Soul 2nd Anniversary Special. 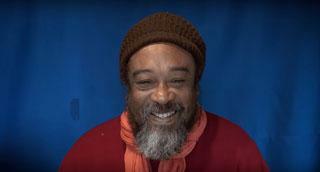 In this beautiful interview Mooji speaks about Monte Sahaja and the spontaneous development of the ashram. The talk gives a little background about some of the key fixtures of Sahaja like the temple created in honour of Mooji’s Master, Papaji, and the many other sages who are honoured at Mount 'Yes'. Mooji then speaks of the Christ Chapel which was completed in the Summer of 2016. This interview offers rare insights from the Master himself about Sahaja and an ashram whose time is come for the great awakening on the planet. 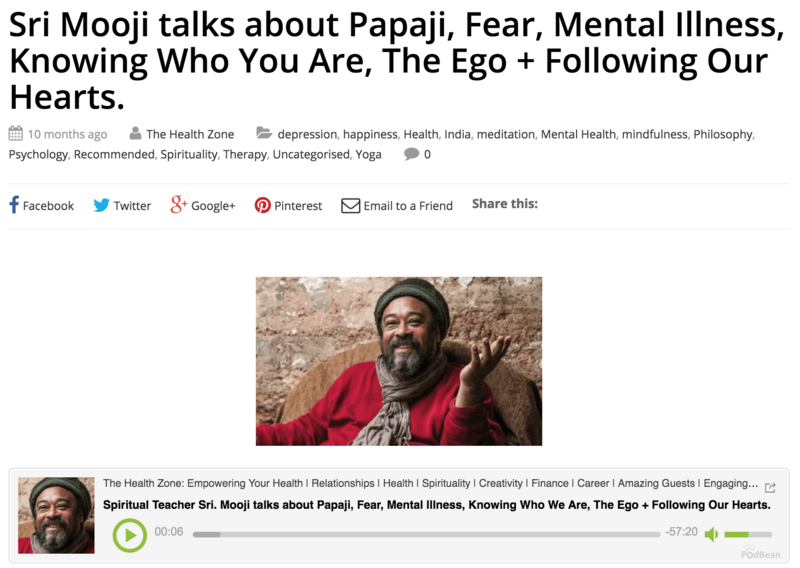 In this hour-long talk, Moojibaba speaks with Micheál O’Mathúna from the Health Zone Show about his master, Papaji and other topics including fear, mental illness, 'knowing who you are', the ego and 'following our hearts'. You can listen to their conversation here. 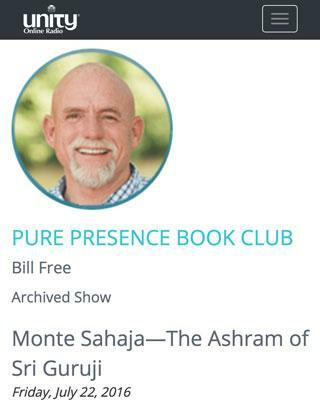 Rishi Bill Free speaks candidly with Mooji of his own resistance around the archetypal image of a Guru Master, being given a name, and about his own experiences as a disciple of beloved Master Mooji and volunteer at Sahaja Ashram in Alentejo, Portugal, a truly mystical experience and utopian lifestyle. This interview was recorded by Phil Cartwright during a break in the 2014 London Intensive. 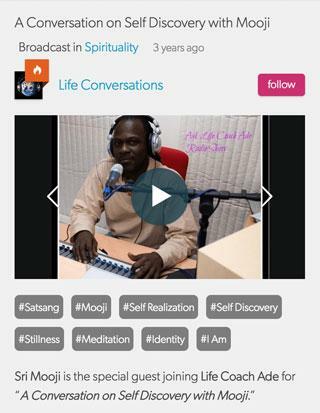 Mooji joined Life Coach Ade Radio Show for a very special edition of the Ask Life Coach Ade Radio Show. 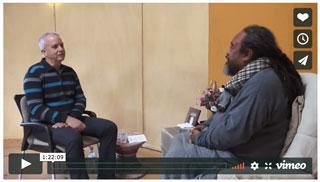 In this interview Sri Mooji is speaking with Life Coach Ade about the nature of Self-discovery. Listen to the show here (Moojibaba joins the show at time mark 29:20). This interview was recorded by Phil Cartwright in Brixton following the November London Satsang Intensive. An interview with Phil Cartwright on SoundCloud, touching on subjects such as Mooji’s upbringing, his journey to India, his meeting with Papaji, and how Mooji began sharing Satsang. Listen to the interview here. Six years after his first interview with Rick Archer from Buddha at the Gas Pump, Moojibaba meets with Rick again for what proves to be yet another inspirational and illuminating encounter. You can watch the recording of this engaging Skype conversation on the “Batgap” website here. 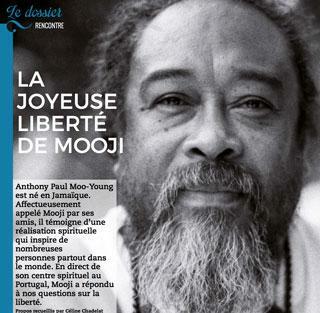 The French written article as a downloadable pdf can be found here: La Joyeuse Liberté de Mooji. 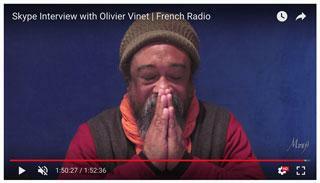 French Radio interview with Mooji by Olivier Vinet of Nouvelle Conscience on Ici et Maintenant Radio (95.2 FM). Ici et Maintenant is based in the Paris region and listeners had the opportunity to call in live to ask Mooji questions. The host, Olivier Vinet, translates on-air into French. Olivier Vinet invites spiritual teachers from all over the world to share their wisdom and their experiences with listeners to remind us of our true nature as infinite consciousness. Jannecke Øinæs from Norway interviews Moojibaba as he speaks about the most important discovery that can be made in the human kingdom and the spontaneous integration of knowledge that comes with falling in love with the Self. Jannecke Øinæs’ website is wisdomfromnorth.com. This interview was conducted with Amir Freimann during his visit to Monte Sahaja in October 2016. Amir previously interviewed Mooji in December 2015 for his book “Transformative Relationships: Paradoxes and Dilemmas”, about the paradoxical nature of the master-disciple relationship. 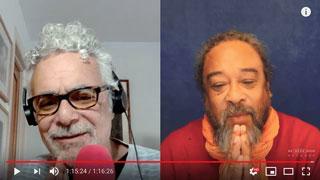 An excerpt from the first interview, in which Mooji discusses how he sees the motivation of some of his students to teach, is on Amir’s website: free2quest.com. 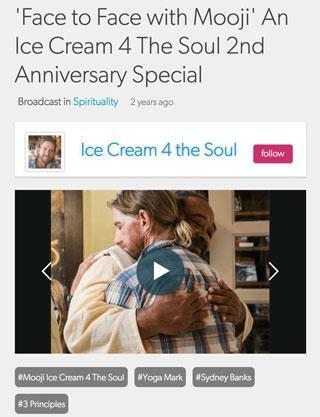 Mooji was interviewed by Raghu Markus, executive director of the Love Serve Remember Foundation via Skype for Mindrolling Podcast. In this beautiful sharing, Mooji, with his renowned directness, warmth, and wisdom, speaks of his own journey, self-inquiry, presence and love, and his bright encouragement and pointing to the Truth already established within each being. An engaging Skype interview featured in the first edition of Lift Your Mind. Mooji speaks with Lisbett about how to transcend the stress and anxiety of daily life into our Completeness. Amy Torres, a well regarded teacher of A Course in Miracles (ACIM), speaks with Mooji about the many miraculous ways that her insights and experiences with ACIM connect with Mooji’s powerful pointings to Truth. 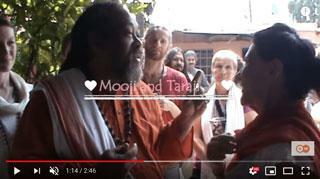 Spiritual teacher Mooji shares his experience about Rishikesh, the divine heart city . 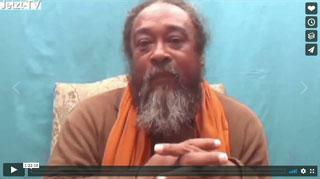 The documentary movie about Satsang with Mooji in Rishikesh. What is satsang? What is happiness? 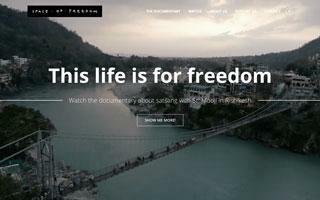 What is freedom? Is there anything unchanging? What is the role of the Guru in the search for Truth? These are some of the questions that documentary “Space of Freedom” addresses with the help of Mooji and other interviewed seekers. The documentary was filmed in early 2015 in Rishikesh, India during the five weeks of Open Satsang with Mooji. It contains the unbeatable wisdom of the Master, beautiful imagery and heart-touching music. Moojibaba was interviewed by Luke Sniewski in Monte Sahaja, in April 2015 for Luke’s documentary series, Million Ways to Live. This series explores the many ways there are to live a happy and healthy life. 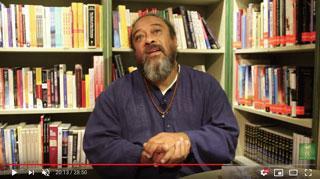 In this interview Mooji speaks about how a real search for completeness has to be something internal and how pain and suffering help us to discover more reflective and meditative qualities within us. 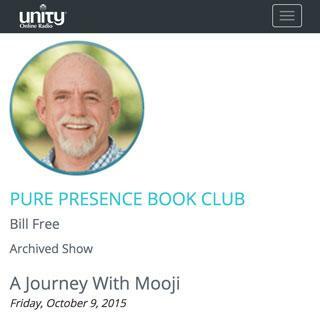 In this interview Moojibaba speaks to Watkins Books about pure awareness, freedom and awakening to truth. A two-part interview recorded on the Watkins Books YouTube channel: Part 1, Part 2. Recording of a live broadcast of Satsang with Mooji on Conscious Life Internet TV hosted by Alex Howard. 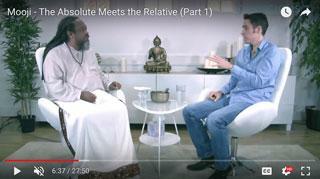 Mooji talks to Alex Howard about the relationship between the absolute world and the relative world. 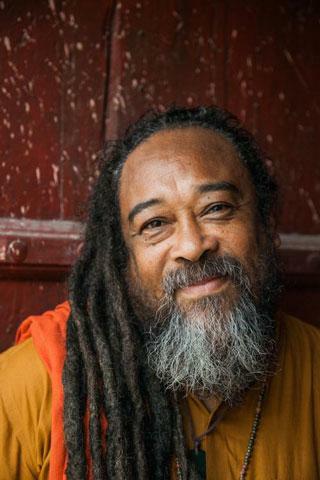 Mooji is a guest speaker at the ‘Awakening as Love’ Online Retreat organised by Grace Bubeck. 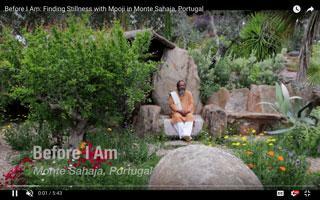 In this interview Mooji speaks about the beauty of awakening to our true nature. If the seeker is honest the whole Universe is supporting this discovery. Grace takes over and the Truth is revealed in such a way that the mind can no longer doubt. You can watch on YouTube or Vimeo. Read more about this interview at www.jetzt-tv.net. 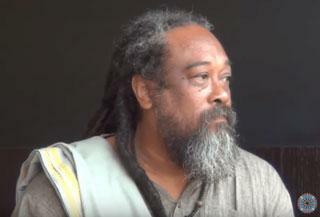 In this interview Mooji discusses the state of the world today and the path to inner peace. The video is available on the YouTube. Recorded in Barcelona, Spain, at the Organisation of II Congreso del Perdon — a conference on forgiveness. The conference featured teachers from A Course In Miracles and also teachers in the Advaita tradition. This in-depth interview with Mooji is nearly two hours long. 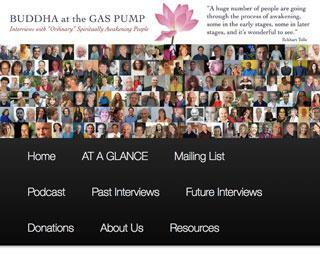 Rick Archer interviews Mooji for his Buddha at the Gas Pump blog — an in-depth interview with strong questions, filmed via Skype. Watch the interview here. The beautiful 3-part interview was recorded by here-now-tv. Reinhold the questioner asks penetrating and salient questions, making this a particularly lively interview. Watch the interviews here. With the release of a new book, Before I Am, Iain McNay of ConsciousTV interviews Mooji about his life and teaching. Watch the whole interview on conscious.tv or in parts on YouTube.